Tell your story by creating a personalised photo book with text. Add captions, headers and dates to document all the little details of your most memorable moments. So, get creative and order your custom photo book from bonusprint. With our easy-to-use creator tools, you can present your favourite pictures in a photo book with text and add descriptions or titles to your images. 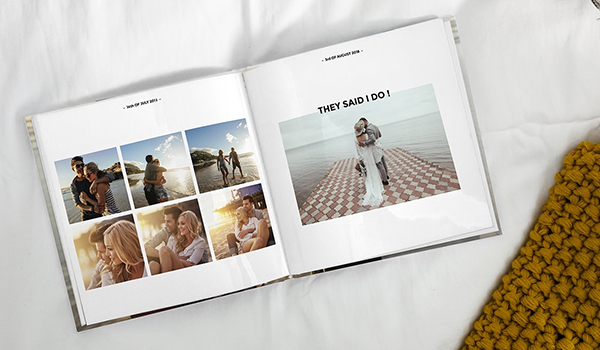 You could document your latest adventure, mark your baby’s first milestones or capture quotes from a wedding speech in an album of your big day. And to caption your snaps in style, you can select from a range of fonts and colours to match your design. It’s easy to create your own photo book with text – here are some tips to get you started. With text, a photo album can help you relive your happiest memories. So, why not add captions to your photo book with our creator tool? When you’ve chosen the book size and style you want to customise, you can start uploading your pictures and creating your captions. Certain styles, like the spiral bound photo book, have suggested text boxes already set out for you. You can edit these any way you like, or you can add new text boxes by clicking the ‘add text’ button. You can even drag and drop text boxes over images ¬– it’s totally up to you. Ready to order your photo book with text from bonusprint? Once you’ve personalised your custom photo book with text, you can have fun adding everything from clip art to frames and masks for those finishing touches. When you’re happy with the design, just click ‘add to basket’. Here you can select a gloss photo book to make those holiday snaps shine or add a luxury finish to your wedding photos. And that’s it; you’re ready to order your photo book with text from bonusprint.